Russian journalist; born in Podmerecz, near Wilna, in 1826; died in Lyck, Prussia, May 21, 1886. At the age of ten he went to Wilna, where he studied in the yeshibah. When eighteen he settled in Sergei (Serhei), government of Suvalki, where he married and continued his studies, becoming a teacher. About 1850 he left Russia for England. While passing through Lyck he made the acquaintance of Eliezer Lipman Silberman, who was then planning the foundation of a Hebrew periodical. After three years of hardship in Liverpool he became a school-teacher, but was finally forced by ill health to relinquish that position. 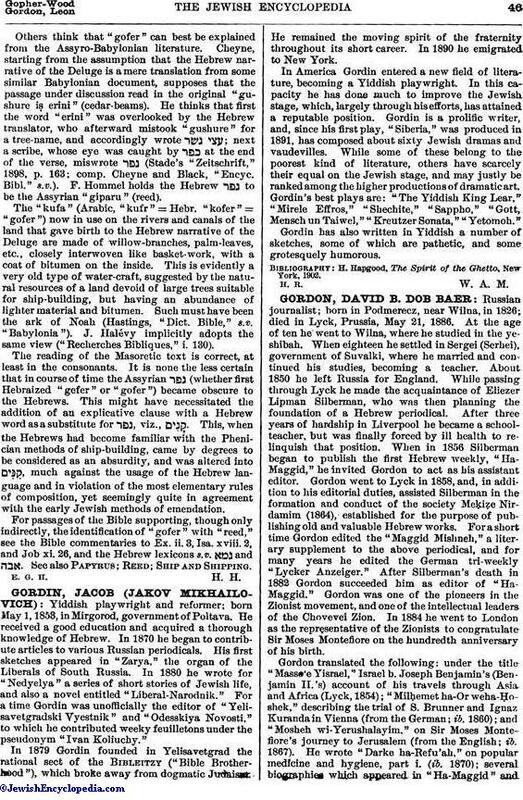 When in 1856 Silberman began to publish the first Hebrew weekly, "Ha-Maggid," he invited Gordon to act as his assistant editor. Gordon went to Lyck in 1858, and, in addition to his editorial duties, assisted Silberman in the formation and conduct of the society Meḳiẓe Nirdamim (1864), established for the purpose of publishing old and valuable Hebrew works. For a short time Gordon edited the "Maggid Mishneh," a literary supplement to the above periodical, and for many years he edited the German tri-weekly "Lycker Anzeiger." After Silberman's death in 1882 Gordon succeeded him as editor of "Ha-Maggid." 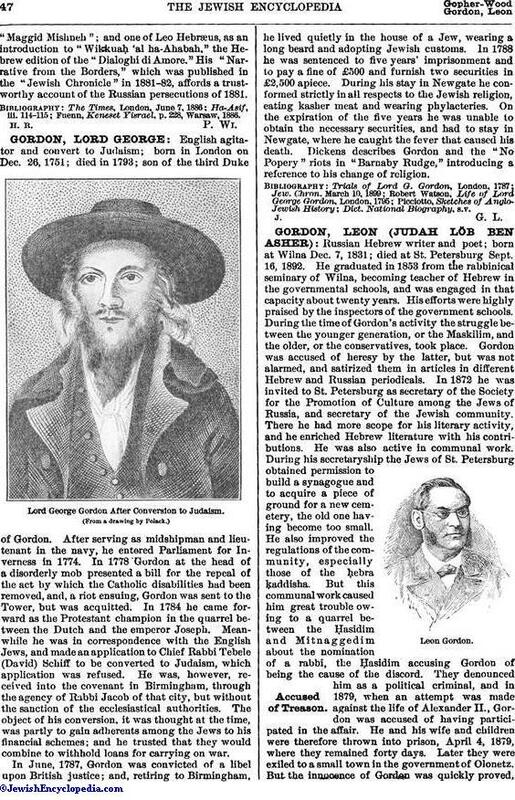 Gordon was one of the pioneers in the Zionist movement, and one of the intellectual leaders of the Chovevei Zion. In 1884 he went to London as the representative of the Zionists to congratulate Sir Moses Montefiore on the hundredth anniversary of his birth. Gordon translated the following: under the title "Masse'e Yisrael," Israel b. Joseph Benjamin's (Benjamin II. 's) account of his travels through Asia and Africa (Lyck, 1854); "Milḥemet ha-Or weha-Ḥoshek," describing the trial of S. Brunner and Ignaz Kuranda in Vienna (from the German; ib. 1860); and "Mosheh wi-Yerushalayim," on Sir Moses Montefiore's journey to Jerusalem (from the English; ib. 1867). He wrote "Darke ha-Refu'ah," on popular medicine and hygiene, part i. (ib. 1870); several biographies which appeared in "Ha-Maggid" and"Maggid Mishneh"; and one of Leo Hebræus, as an introduction to "Wikkuaḥ 'al ha-Ahabah," the Hebrew edition of the "Dialoghi di Amore." His "Narrative from the Borders," which was published in the "Jewish Chronicle" in 1881-82, affords a trust-worthy account of the Russian persecutions of 1881. Fuenn, Keneset Yisrael, p. 228, Warsaw, 1886.